OnePlus One users might be waiting for the new Lollipop based ROM for their smartphones. The wait is over as the popular Chinese smartphone maker OnePlus has finally released its own custom ROM -- OnePlus OxygenOS, which is based on Android 5.0 Lollipop. Last month, the OnePlus announced the official release of its in-house OxygenOS to 'One' on or before March 27, but was failed to deliver the update due to a couple of security issues discovered in the update. The news disappointed many OnePlus customers, including me, who were looking forward to their Lollipop updates. However, the update is now ready for downloading from the OnePlus servers. Also, a full installation guide has been provided for customers who want to switch from the CyanogenMod 11S to the latest OxygenOS. "Developing OxygenOS has been an incredibly fun and challenging experience for all of us," the company wrote. "In this environment where everyone is fighting to standout with custom ROMs, we think it’s important to go back to basics. We place things like performance and battery life over gimmicks and bloated features." OxygenOS comes with stock Android UI, and also adds some new custom features, such as Clear Image, and lock screen gestures. The update has been developed by the company with the help of developers from the Paranoid Android team. Ability to switch between hardware and software navigations and so on. Quick Settings lets you rearrange tiles in the notification tray and so on. 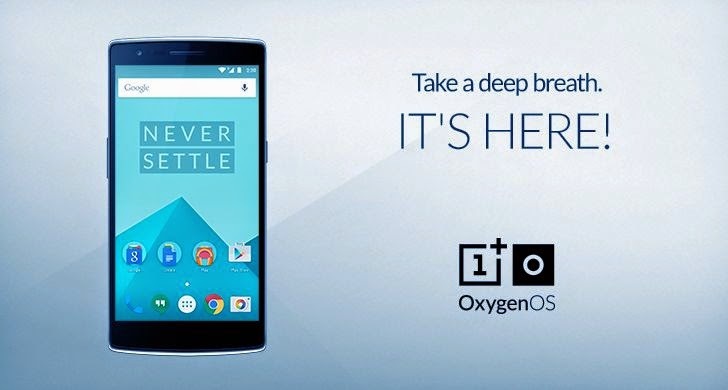 The file size of OnePlus OxygenOS is 739.7MB, and it brings Android 5.0 Lollipop to OnePlus One. Android users can install OxygenOS now by going to oneplus.net/oxygenos, but make sure that you have a OnePlus One smartphone device.